COB Calais pulled off the biggest win during the last last weekend of LF2 action before the Christmas break against Léon Trégor (65-63). In a match that had 15 lead changes and 11 ties, it was the calmness of the visitors from the free-throw line that settled the game. Léon Trégor are almost unbeatable at home and with their dominance on the boards (41-33) they should have been celebrating a victory. Instead they were poor in shooting from the three-point land with 1-of-13 and unsteady from the free-throw line with 14-of-22. COB Calais on the other hand went 9-of-10 from the free-throw line and their captain Aurélie Cibert (16 points) was 4-of-8 from behind the arc. Despite another big game from Oumou Kalsoum Touré with 22 points and 15 rebounds for the hosts it was the clever positioning of Floriane Herrscher (19 points) that gave Calais the edge as the game came to its close. Keirra Mallard (10 points) who is beginning to find her way in French basketball scored the game winning shot in the last minute. 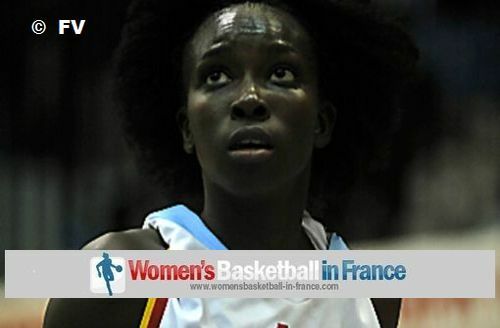 For Léon Tregor Leslie Matenga (10 points) was enjoying an extended run due to the absence of Aude Kernévez while Maria Butard continued her scoring spree with 18 points. 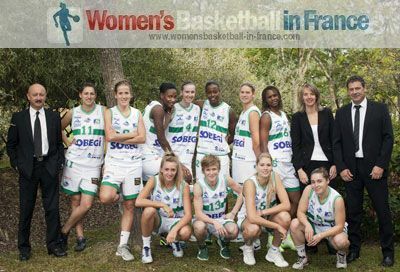 This result leaves Calais alone in second place, one game behind the LF2 leaders Cavigal Nice, at the half-way stage. Léon Tregor are tied for 3rd place with Angers. Ingrid Bunel scored 11 consecutive points for Pau-Lacq-Orthez as she single-handedly brought her team back into the match against Reims during the first quarter. She finished with 15 of her team's first 21 points as they trailed (21-23). The two teams traded scores during the second quarter with Pau able to go into the locker room all square (36-36) thanks to Mariame Dia. The hosts took charge during the third quarter and went into the final quarter leading (61-50). Yet within three minutes of the final quarter Reims were back in front on the back of 2 three-pointers by Pauline Lithard and some hard work from Maud Lesoudard. Pau then took over control with Awe Geye (19 points) and the hard working Dia (20 points) to win another exciting match (78-73). Yet what is happening to Janeka Lopp absent in this game as she had been suspended by her club? Illkirch-Graffenstaden had no trouble in beating the CFBB (87-51). Céline Schmitt was quiet despite scoring 24 points and picking up 9 rebounds while other players were given a chance to gain experience in LF2. For the CFBB the negative series continues with their 11th consecutive defeat. In the final game of the weekend US Laveyron muscled their way past Roche Vendée (72-66) with Elena Vishnyakova helping herself to 17 points. Pulcherie Ayi and Leslie Fournier had 16 points each while Elodie Tadeuszak completed the double-digit scoring with 14 points. For Roche Vendée Johanna Tayeau led the scoring with 21 points. At the end of the match Etienne Faye the coach from US Laveyron said that he was satisified with the results and that his players followed the plan, alternating their offensing options and made good choices when shooting three-pointers. For Roche Vendée their coach Emmanuel Body responded that his team did not play well. They turned the ball over too often and lacked the intensity to win the match. In the other game from this round Anger had beaten Limoges (82-44) in a match played during round 5 in October. We have included the official regular season standings as issued by the French Basketball Federation (FFBB) below. It should be noted that all the teams were handed a 20-0 victory against Etoile de Voiron and SO Armentiéres although they are not included in the table. This is the reason that the CFBB have two victories to their name despite not winning a match this season.